For every well-known and iconic Moog recording in the annals of Moog history, there are literally dozens of lesser known and forgotten recordings. But being unknown doesnt make these recordings any less interesting. With this in mind, I want to introduce the recurring theme of Moog Obscura to this blog, a celebration of worthy recordings that got lost in the shuffle during the massive outpouring of Moog recordings during the late 1960s and 1970s. Each of these recordings, and images, comes from my archive of Moog Modular recordings. Im going to begin this entry of Moog Obscura with a few rare singles, followed by several albums. Rick Powell (1935-2006) is a familiar name to enthusiasts of early Moog history. Powell was a composer, producer, and arranger of Christian music who bought a Moog Modular of his own in 1969 and recorded at his company Athena Records in Nashville. His studio became the hub of early country Moog albums, helping professor Gil Trythall with his two Moog albums of country music (Country Moog, 1972; Nashville Gold, 1973) and Ricks own Switched-on Country (1970). Powell was also producing several albums of rock and folk music during this time and invariably found a way to sneak in a few sounds of the Moog on the tracks. Two cases in point are albums by Martha Radclyffe (1970) and the cult classic Livin Lovin by the all-female Feminine Complex. 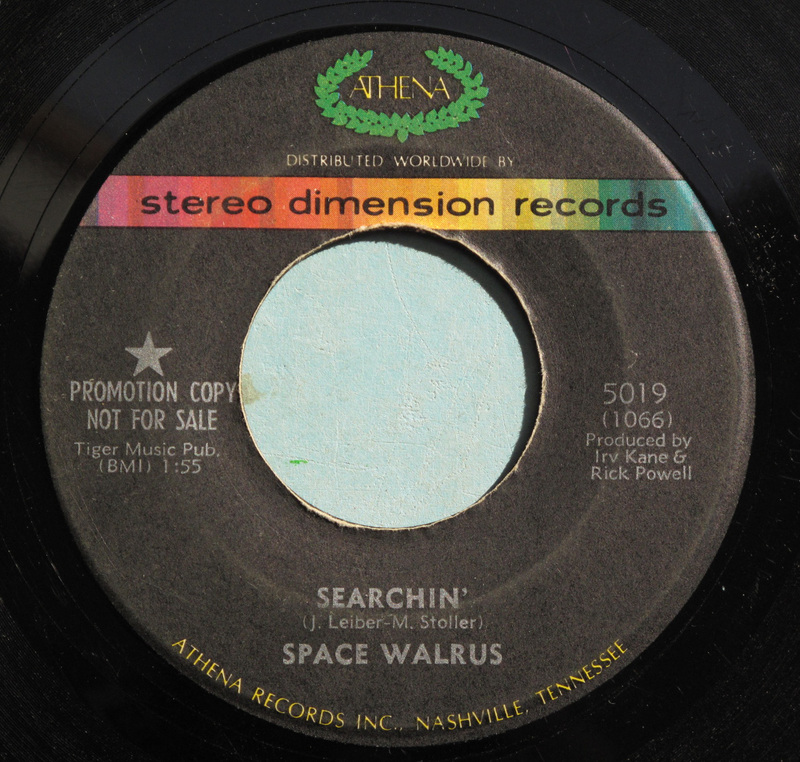 It was during this time that a 45-RPM single by an unknown group names Space Walrus appeared. The single includes two cover versions; “Searchin,’ which was a hit for the Coasters in 1957; and Grazin in the Grass, a big instrumental hit for South African trumpeter Hugh Masekela in 1968. For the Athena session, these tracks were probably played by studio musicians and Powells Moog is prominent on both tracks. For the bubbling Searchin, he provides some spunky rhythm tones and a novel vocal track produced by connecting a microphone to the Moog and modulating its output. Grazin in the Grass features a studio band playing the main horn and rhythm parts while Powell responds to the funky beats with a bevy of Moog rhythms that joyfully meander into near chaos by the end of the track. 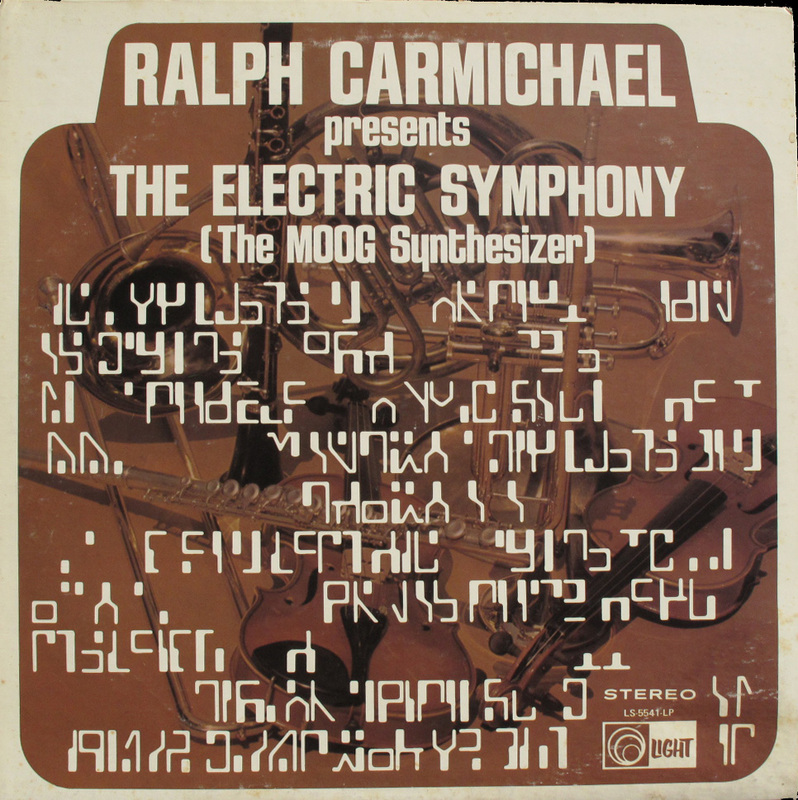 Two of recordings on this list have a connection to Wendy Carlos, the musician whose Switched-on Bach (1968) catapulted the Moog into the musical spotlight. Before the instant success of that SoB, Carlos had worked for many months with producer Rachael Elkind to finish that album, not really knowing if it would meet with success or not. As a result, they hedged their bets a little by dabbling in the occasional production of rock and pop music. This single by the Queens group Childe Harold is a case in point. Produced by Carlos and Elkind, this single features two pop-rock tunes with prominent Moog parts, skillfully programmed and played by Carlos. Booming bass lines, Bach-like interludes, sweeping sonorities and sound effectstheyll all there in accompaniment of the rock band. The end of Brink of Death even features a sequence of thundering beats that foreshadows Carlos own Timesteps for the soundtrack of A Clockwork Orange a couple of years later. Carlos told me that she had been hoping at the time to work with Bert Sommer of The Left Banke, a popular rock group known for its blend of baroque music and rock. 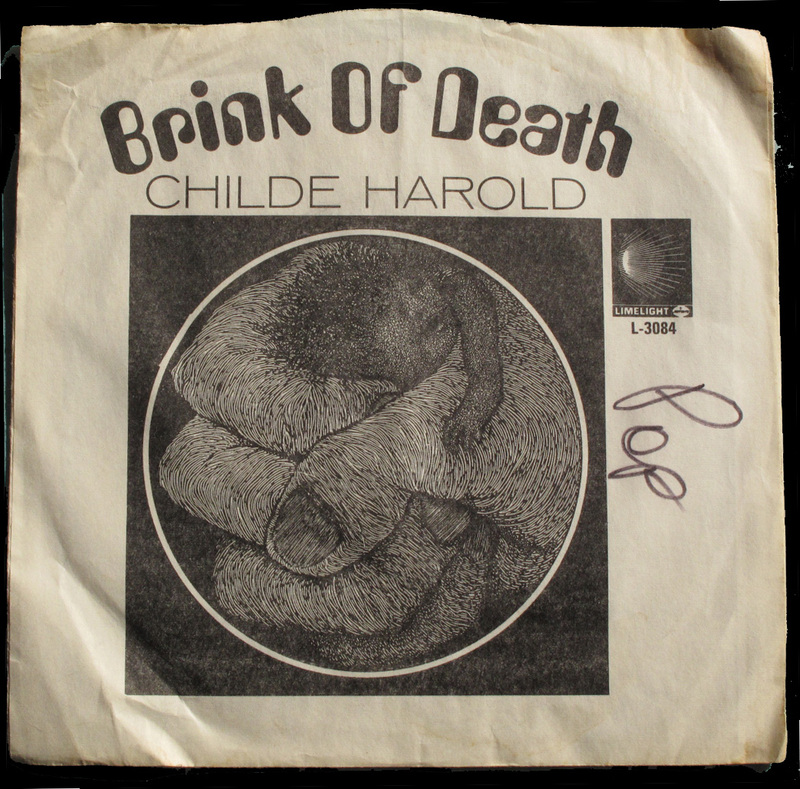 But when Sommer never came through, they decided instead to record one of his songs, Brink of Death, with Childe Harold. Carlos wrote the song on the flip side of the record, Anne, With Love. My copy of the record has a picture sleeve. Even though the sleeve is stamped as a promotional version, it isnt the white label promo version, which only had one track, Brink of Death, on both sides: one in mono, one in stereo. Mort Garson (1924-2008) is one of the most legendary producers and artists to use a Moog Modular Synthesizer. He was a songwriter, producer, composer of soundtracks, and one of the first Moog artists to bring the synthesizer to popular music. He had a knack for creating a Moog record for every new trend in pop culture. 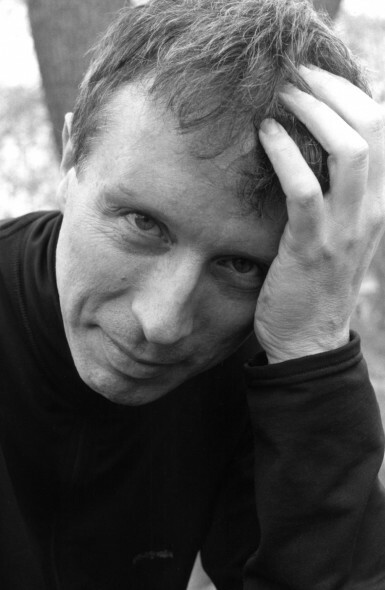 For astrology enthusiasts, he created The Zodiac Cosmic Sounds (1967) and twelve follow-up LPs; for stage and screen productions he produced The Wozard of Iz (1968) and Electronic Hair Pieces (1969); in response to interest in the occult, Black Mass Lucifer (1971), Ataraxia: The Unexplained (1975); even a LP of a couple making love to the sounds of electronic music, Music for Sensuous Lovers (1971). Garson was clearly in a groove here. 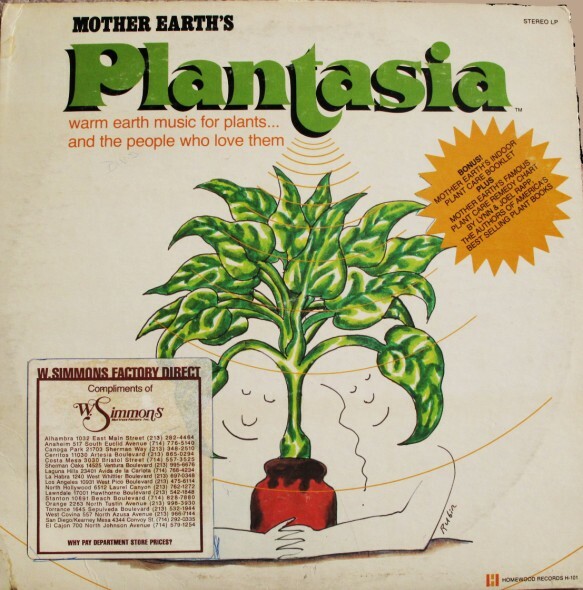 I believe that this project was a co-production sponsored by Mother Earth magazine, which published a plant-caring booklet enclosed with the album. My copy also seems to have been distributed by W. Simmons Mattress Factory Inc., which placed a prominent sticker on the cover. Buy a mattress and get a free copy of “Plantasia”? Sounds like a deal to me. There have been several works of electronic music based on the theme of the human body. Some of the best known are Music from The Body (1970) created by Scottish electronic music whiz Ralph Geesin with Pink Floyds Roger Waters using sampled sounds from inside the body. In 1976, Italian electronic music pioneer Teresa Rampazzi produced the soundtrack for a television documentary called Musica Endoscopica. Dutch composer Johan Timman released this Moog-heavy ode to the human body, Trip Into the Body, in 1981. By that time, even though the Moog Modular had become outdated, Timman featured the signature modulations of the Moog on this pulsing electronic excursion through the body. 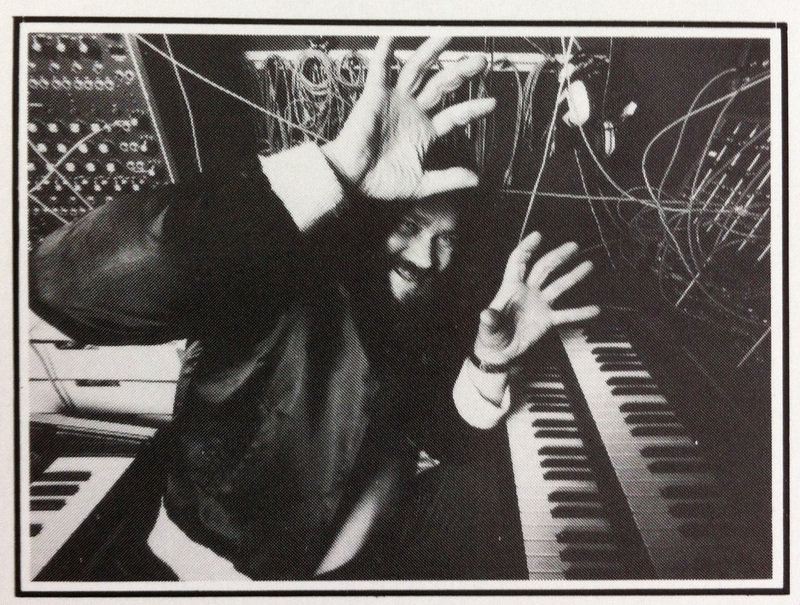 He lists both a Moog Modular 55 and System III, and their modules, in the liner notes. He was also a hoarder of several other Moog products heard on the album, including a Polymoog, Micromoog, Minimoog Taurus Pedal Synthesizer, Multimoog, Moog Liberation and several other instruments by other companies including Oberheim, EMS, and Synton. The musical style is most similar at times to Tangerine Dream with the addition of vocals using a vocoder. 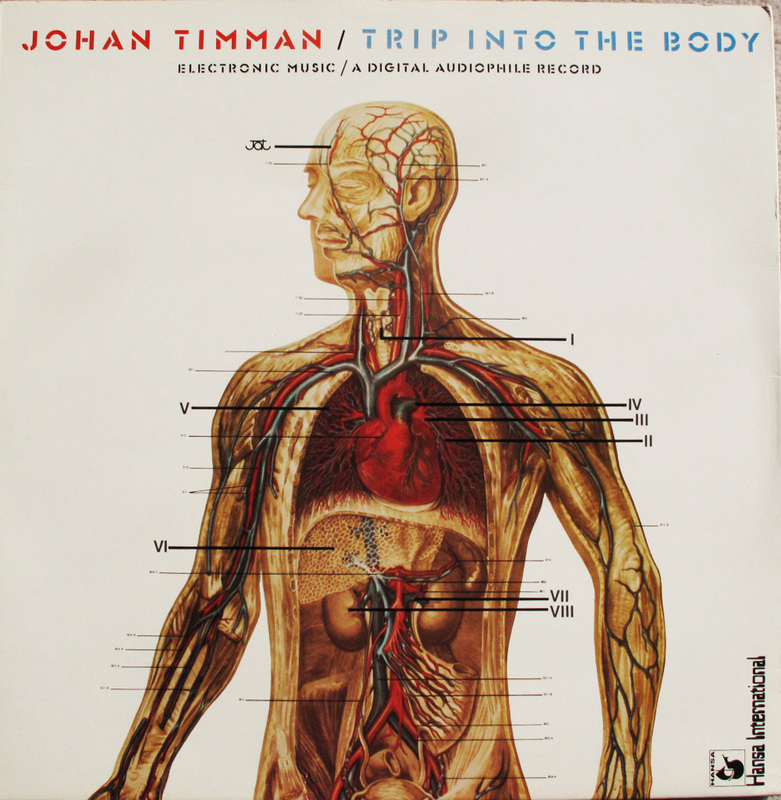 Trip Into the Body is a wonderful smorgasbord of vintage synthesizer production. 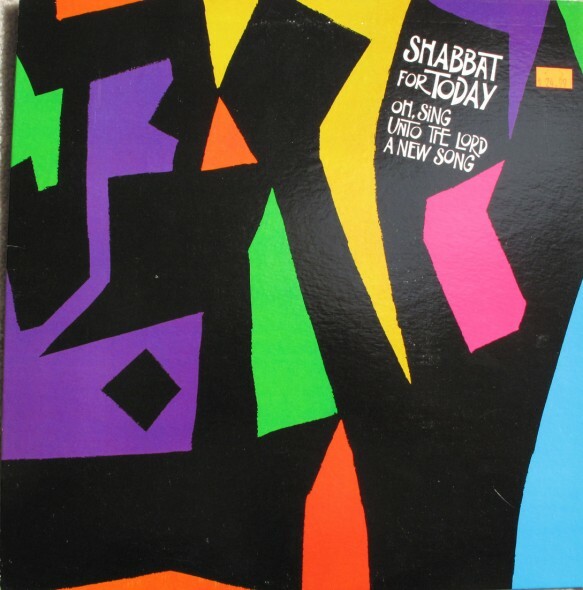 A later version of Shabbat for Today was released on iTunes as the album American ClassicsGershon Kingsley: Voices from the Shadow and Jazz Psalms, Shabbat for Today. Gershon Kingsley, the genius behind Popcorn and several other early Moog pop classics, also has several other eclectic Moog accomplishments under his belt. One was the result of an invitation in 1968 to compose and direct a Shabbat program for a New Jersey reform synagogue. This work featured a rock combo, choir, cantor, and, of course, his beloved Moog Modular Synthesizer. The original performance, captured on a rare, privately released recording called Shabbat 68, led to several additional guest appearances featuring the work in the New York and New Jersey area. Listen to samples from the entire LP at the Juno Records site. The story of this recording brings us back to the Wendy Carlos connection. In late1968, Columbia Records had a massive release party for three new albums, In C by Terry Riley, Switched-on Bach by Carlos and Rock and Other Four Letter Words by two rock journalists, J. Marks and Shipen Lebzelter. 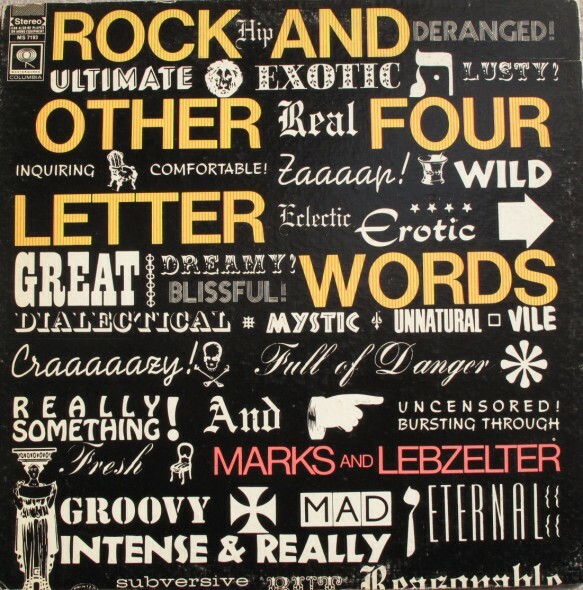 Columbia fully expected the Marks and Lebzelter LP to be the standout hit and featured it most prominently at the release party. History tells us, however, that while the Riley and Walters discs became instant classics, Rock and Other Four Letter Words disappeared without a trace almost immediately. Its there in the midst of the droning, clamorous industrial sounds, tape loops, echo, and social commentary. Listen to “All My Life” here. Carmichael became known as the father of contemporary Christian music back in the 1970s, after already having had success making records with Nat King Cole and writing arrangements for Ella Fitzgerald, Bing Crosby, Jack Jones, and many more pop singers. One of his most unusual experiments in Christian pop music was this album called The Electric Symphony, an instrumental set featuring multi-tracked Moog compositions set to a conventional rhythm section. Its an amazing and tastefully conceived set using a wide spectrum of Moog sounds and programming. Fred Werner programmed the Moog, with music arranged by Carmichael and Clark Gassman. Several tracks, including The New 23rd feature deftly executed Moog solos over a bed of effective supporting tracks. This record always surprises me when I hear it and although some of the techniques may sound cheesy today, creating this record must have involved many painstaking hours in the studio to reach this level of exactitude. 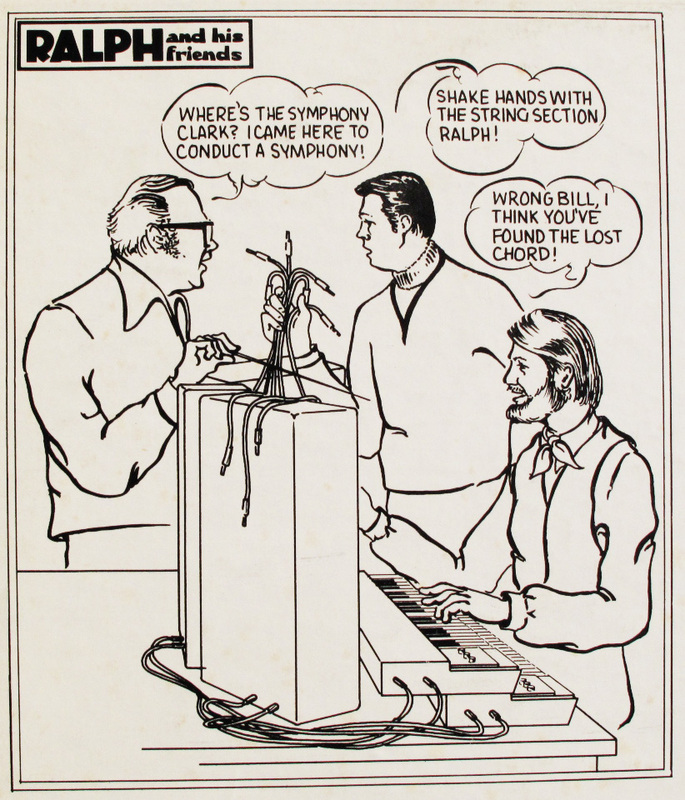 The back cover also has an amusing cartoon depicting the puzzlement of Carmichael and his colleagues over the Moog. Hi. I didn’t check out all of the blogs, but how about “Everything You Always Wanted to Hear on the Moog” by Andrew Kazdin and Thomas Z. Shepard. This is one of my favorites. and “MOOG!” by Claude Denjean SP 44155 in phase 4 stereo. If you need photos of the album covers, let me know. Scottish electronic music whiz Ralph Geesin . It’s RON GEESIN.